March 20, 2013 - For February, the boy ended up at Wendy's twice, with an annoying buzzer/bell as one of the prizes. It is part of an "I Spy" game, but we've yet to actually play the game. Just endless bell ringing. 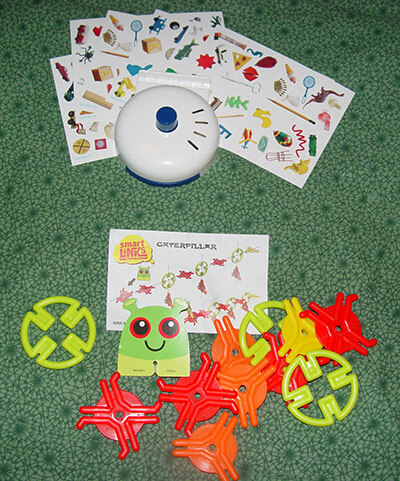 The other toy was a small set of Smart Links connecting pieces to build various shapes. He still has a set from last year around here somewhere, hopefully they'll turn up and then he can build something larger and less nebulous. - Taco Bell lists NBA trading cards (over 150 to collect, you get 5 in each pack) as their current item, with a Dive Olly Dive book for the kids under 3. - The Chick-fil-A site lists Spot What! 3D books as the goodies in their Kid's Meals. The "kids under 3" item appears to be a board book. - Sonic has five different monster truck vehicles in their Wacky Pack meals. The vehicles come with stickers and trading cards. - Burger King has Cut the Rope: Time Travel toys in their Kids Meals, with Jurassic Park toys coming soon. - Carl's Jr. and Hardee's have Rise of the Guardians toys, with Man of Steel toys coming in late April. - Wendy's Kids Meals have "I Spy" toys listed. The "Kids Under 3" item is a board book. Cranium Brain Breaks toys are shown as coming soon. - Subway Kids Meals have reusable lunch sacks. The sacks now feature Phineas and Ferb. - The Arby's web site shows Shape & Solve puzzles, with Encyclopedia Britannica science/nature toys coming soon.